With more than 35 years of experience in the management, psychology, and training fields, Dr. Jeffrey W. Drake is an exceptional motivational speaker. During his career, he has worked in and consulted for a number of industries, including banking, credit union, education, government, health care, information technology, insurance, manufacturing, real estate, and retail. His enthusiastic yet practical style relates to many types of audiences. He has authored and presented training programs for and has consulted with a number of corporations and organizations such as Advisory Board Company, American Society of Employers, Avista Corp., Axio Research Corporation, Center for Banking Education, Credit Union Leagues, C. U. Processing, Inc., Digital Horizons, Diplomat Specialty Pharmacy, General Motors, IBM, Ikaria, Inc., Michigan Department of Education, Myriad Genetic Laboratories, Network Data Systems, Prudential, Real Estate One, Schering-Plough Research Institute, Sony, and TRW. Jeff has worked as a facilitator or instructor on the campuses of Central Michigan University, Eastern Michigan University, Grand Valley State University, Michigan State University, Oakland University, Sam Houston State University, University of Detroit, and University of Michigan. As a trainer and professional speaker, Jeff has been characterized as motivational, unique, informative, practical, inspirational, enjoyable, and fun. Participants leave his programs with a compelling motivation to make practical changes in their professional and personal lives. Do you want Jeff to speak at your next event? Then contact us today! Client Comments about Jeffrey W. Drake, Ph.D.
"Dr. Drake was a pleasure to have as a speaker. I learned so much from him. He's a great guy!" "Jeff was an excellent speaker. He made the seminar fun and informative." "Dr. Jeffrey Drake's parallels to real world going ons and our necessary mission were the most helpful part of this seminar." "A great start!! Motivational speaker. Interesting, worthwhile day." 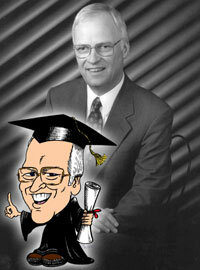 The Caricature of Jeffrey W. Drake, Ph.D. The AchieveMax® caricatures provide a starting point for others to see the creative side of the AchieveMax® team of speakers and consultants. Jeff's caricature shows the academic side of his personality. Jeff has a Doctor of Philosophy from Wayne State University. Articles by Jeffrey W. Drake, Ph.D.
To read more about Jeff, make sure to read our newsletter, The Achiever. 3-2-1 ACTION! : What is an AchieveMax action team?